Moose Falls was a small 30ft waterfall with pretty healthy volume on Crawfish Creek near the Southern Entrance of Yellowstone National Park. What was peculiar about this falls was that the water appeared to be geothermally heated (which you can see from the steam rising in the picture at the top of this page). 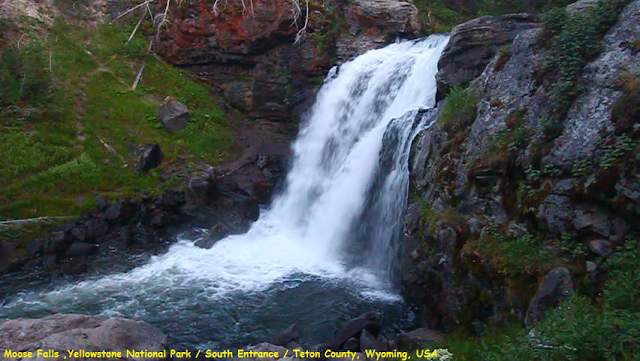 The falls was named after the local fauna who tend to prefer the swampy southern section of Yellowstone National Park. However, this waterfall was also once referred to as the "Crawfish Falls" since it sat on the creek with this name. This was noteworthy because crawfish tended to thrive in the warmer waters of the Gulf Coast of the USA. It is the kind of hike that is so short and sweet that there’s really no point in not doing it. With the entire hike (if you could even call it that) adding up to less than a quarter of a mile, it’s the perfect stop along your way to or from Grand Teton National Park. So whether you’ve already experienced a great diversity in Yellowstone’s waterfalls, or you’re itching for your first taste, this is a must-do partly because of its beauty and partly because of its easy access.